Sub-Pop doo-wop for an indie-rock sock hop from the Unicorns' Nick Thorburn and Man Man’s piano-puncher Ryan "Honus Honus" Kattner. A dark take on doo-wop by an indie-supergroup is a terrible premise for an album -- and referring to it as "doom wop" does little to make the case that Mister Heavenly is more than a contrivance crafted by already famous musicians, whose celebrity all-but guarantees it’s commercial success. Perhaps it’s that they avoided the obvious pitfalls of recreating 1950s R&B: sappy love songs, predictable ice-cream chord changes and hokey, onomatopoeia-laced backup vocals. Alright, upon further review, the latter is there, but "ooh-waaahs," "doh-dohs" and "whoop-oh-oh-ohs" can, in fact, be charming when done with taste. Mister Heavenly consists of guitarist Nick Thorburn of the Unicorns, Man Man’s piano-puncher Ryan "Honus Honus" Kattner and Joe Plummer, who has long kept the pace for Modest Mouse. The trio crafted Out of Love under three commandments: keep it short, keep it simple and keep it rooted in classic doo-wop. Classic doo-wop, bands like the Coasters and the Penguins, were focused around the creative use mankind’s most evocative and sympathetic instrument: the human voice. Consequently, the success of this recording is hinged on the interplay between the voices of Kattner and Thorburn. They are, no doubt, an odd couple. Kattner shouts from his belly and Thorburn articulates in a nasally drone. They are, nonetheless, compatible in a way that is sometimes in harmony and sometimes at odds. Typically they trade lead vocal duties several times per song and reserve harmonizing for moments when it really counts. R&B is all about emotion and good artists recognize that emotions are complicated. 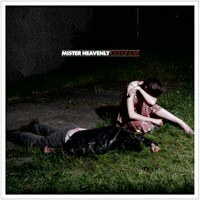 It’s neither easy to express sadness in a happy way or happiness in a sad way, but Mister Heavenly does both nicely. Kattner’s exuberance has an uplifting energy despite that, as a lyricist, he is very despairing. Conversely, Thorburn has the kind of high voice that sounds dreary and lonesome no matter what he’s singing. Mr. Heavenly makes all their noise with a keyboard, electric guitar, bass and drums. Kattner’s rhythmic chording on the keys is the cornerstone of the sound, much as it is in Man Man, but without the hysterical interludes and jerky key-mashing. The leads are generally provided by Thorburn in the form of short, major-scaled guitar licks that recall surf music and mimic the vocal melody. The fact that his guitar playing is often shadowing Honus’ voice instead of his own, displays a keen awareness of his musical surroundings. Joe Plummer’s contribution is variety. If you listen carefully, each song on Out of Love has a conspicuously different drumbeat, providing excitement to arrangements that might otherwise be indistinct. The production on Out of Love is natural and slight. The takes are organic, sounding live rather than overdubbed. The instruments are separated and spread wide in the stereo mix and vocals are touched with just enough reverb to give it a boutique sound. Practically mandated by genre, most of the album is love songs. The most interesting of which is "Pineapple Girl", a wordy tune that recounts the pen-pal relationship between young American Sarah York and Panamanian dictator Manual Noriega in the height of his notoriety. Peculiarly, the vocally slender Thorburn sings as the General to Kettner’s 10-year-old girl. Lyrically, Honus’ contributions are clever puns like "Unsung maladies" and "When push comes to love" and "Her lips are like ships that sail through the thoughts you harbor." He also has an innate ability for keeping things weird. For example, “Diddy Eyes” might be a dismissible style spoof if not for Kettner’s bizarre lyrics that leave you wondering if he’s singing about a metaphorical love potion or roofies. Though Thorburn gets dark too on songs like "Bronx Sniper", he’s better at bringing beauty like the luring hook on "Harm You" and the sneakily innocent "Your Girl". Out of Love isn’t perfect. The sequence of the songs doesn’t do it justice as a collection, there are a couple of tracks that are dispensable and it lacks that one special song that makes you want to kick over your chair and make love to the room. But it does a lot of things right: it’s nods to a retro-style without sounding like a parody, it’s musically exciting and it has interesting lyrics that explore a theme. That theme: love. Mister Heavenly characterizes loves as a creator and a destroyer, an inspiration and a casualty. The benefit of inventing a musical category is you start off as the best and no one can say you did it wrong. Doom-wop is a funny turn of phrase, not a bona fide genre, but that doesn’t matter here because Out of Love succeeds on its own.